In a recent paper by Aubrey et.al published in the Journal of Strength and Conditioning Research, significant differences in oxygen consumption were reported from treadmill to overground running without evidence of a corresponding change in Stryd reported running power. Details can be found here. a) The main bit of detail is that there was a significant change in VO2 not reflected in corresponding power readings between treadmill and overground running. b) The other statement made in the paper is that a weak correlation was found between oxygen cost and power:weight ratio across all runners, elite or recreational, suggesting that "running power as assessed with the Stryd Power Meter, is not a great reflection of the metabolic demand of running in a mixed ability population of runners". In a rebuttal of point b) in the paper, Dr. Snyder from Stryd accused the authors of "fatal methodological flaws" when they chose to normalize both metabolic rate and power/weight ratio with speed while pointing to a weak correlation between the two variables (r = 0.29, p = 0.02). Dr. Snyder's rebuttals are examined with the help of data from our old friends, Dutch researchers from the Secret of Running group. From their blog, I extracted mean VO2 and mean power/weight ratios from treadmill testing belonging to a subset of 6 runners in random fashion. Statement 1 : Rate of oxygen consumption is approximately proportional to speed (linearly dependent upon speed with a y-intercept of close to zero) across both elite and recreational runners (Batliner et al., 2018). This means all values for the rate of oxygen consumption measure when normalized by speed (otherwise known as cost of transport)* will be approximately constant, giving virtually no variation in these values other than that due to noise or subject variation. Therefore, regardless of Stryd power’s dependence upon speed, no correlation would be expected between the normalized measures. Aubrey et.al normalized metabolic rate in ml/kg/min with speed measured in m/s. Such a division does not result automatically in the oxygen cost of transport. So by calling this normalization "cost of transport", Dr. Snyder is not dimensionally correct because the x-axis in the Aubrey paper shows values ranging from 9 to 17 (see Figure 1 in their paper). Such low double digit values cannot align with the oxygen cost of running, which is in the triple digits. 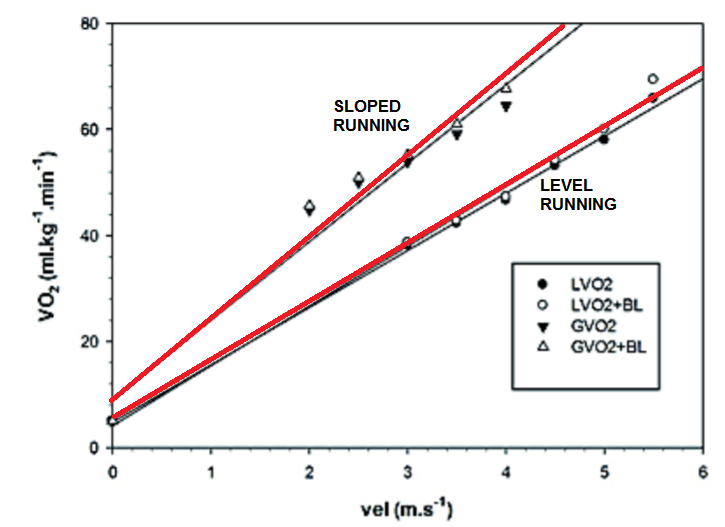 Behavior of oxygen consumption with speed can be examined from the data of Secret of Running. The plot in Fig.1 shows that for 6 different subjects, metabolic rate is mostly linearly proportional to speed. 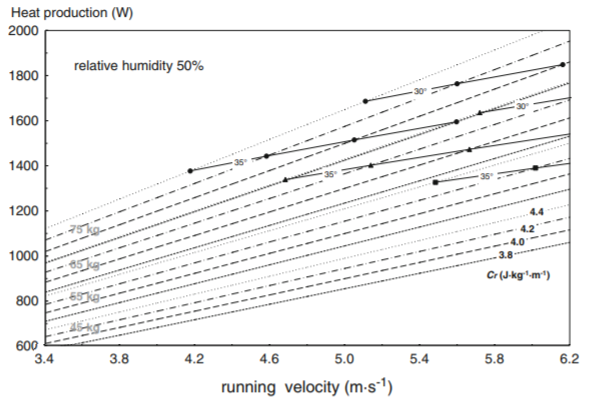 Fig 1 : Metabolic rate vs running speed measured in 6 subjects. Source of data : Secret of Running (Dijk, Megen). Converting these values to an oxygen cost of running with the appropriate formula in 1) transforms the plot into the following plot in Fig.2. As Dr. Snyder states, the linear relationship between speed and oxygen consumption becomes nearly constant save for noise and subject variation. Infact, when looking at this plot, the data looks less noisy for some runners (4,5,6) and more noisy for others (1,2,3). What is the source of this variation? Some explanation would be good. 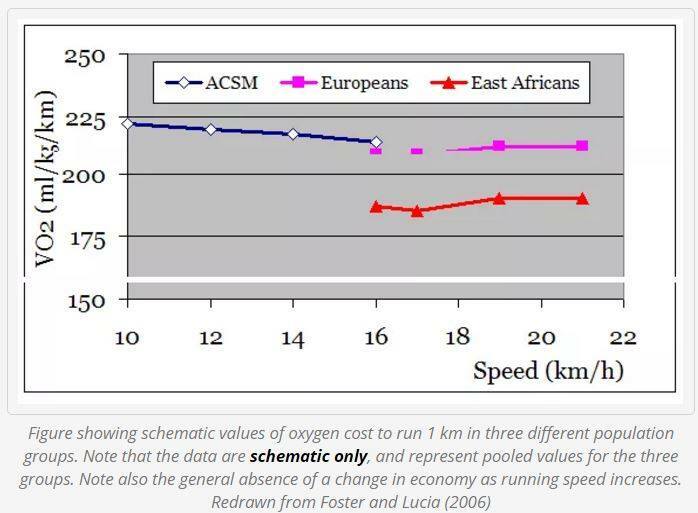 Fig 2 : Oxygen cost of running vs running speed in 6 subjects. Source of data : Secret of Running (Dijk, Megen). What does research say about this relationship? According to the plot in Fig.3, there is a "general absence" of a change in oxygen cost as running speed increases. However, because of the noise from the Stryd sensor, this constant relationship is not exactly seen. 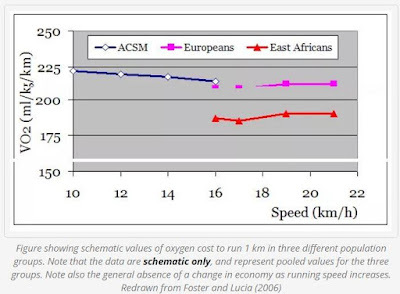 From looking at Fig.2, we cannot make the claim that some individuals somehow magically reduce their oxygen cost as speed increases. The fundamental source of these fluctuations appear to be noise. It is precisely this noisy bit that requires further examination if such devices are to be applied among elite runners as a "surrogate" measure of oxygen cost. Not that I didn't warn about it on the Stryd Facebook page many moons ago. Statement 2 : Stryd power’s strong linear correlation with rate of oxygen consumption, however, indicates increasing Stryd power with increasing speed, meaning any variability would be reduced by normalization with speed. Thus, any correlation whatsoever between the normalized measures would be small and due to chance, unaccounted for nonlinearities, or subject variation, not the dominant linear relation with speed that underlies both non-normalized measures. The relationship between Stryd power/weight ratio and treadmill speed can be examined in the Secret of Running data. By way of algorithmic implementation, Stryd power/weight in strongly linear in speed (Fig.4). But on closer inspection, not all subjects show linear proportionality. Infact, in this data, there doesn't appear to be anything close to perfectly linear relationship. Almost all datapoints show a wavy pattern. Some appear comical. Subject 6 shows markedly high power ramp beween 15 and 16 kph compared to that between 16 and 17kph. Subject 1 on the other hand exhibits something that looks like a curvilinear relationship. What is the cause of these artifacts? There is no reason why some runners should take more effort to "jump" between two speeds compared to other speeds. The treadmill test is a continuously administered test with no "breaks" in between each speed. The other explanation could be the choice of value of VO2. 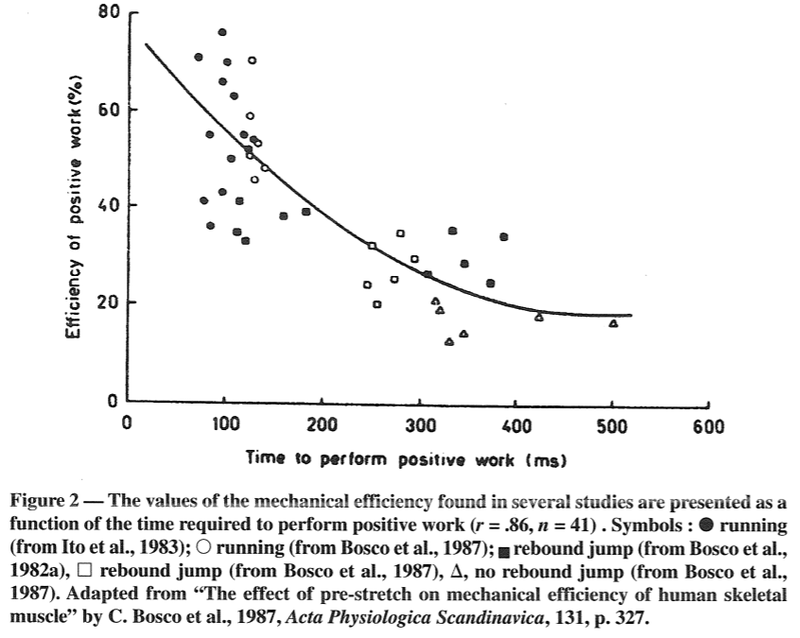 It hasn't been explained by the authors of Secret of Running on what basis they chose steady state values. Were some intervals shorter than others, affecting the average of VO2 in that interval? Fig 4 : Stryd power/weight ratio vs running speed in 6 subjects. Source of data : Secret of Running (Dijk, Megen). When the above data is normalized by speed using the expression in 2), we get the following plot. 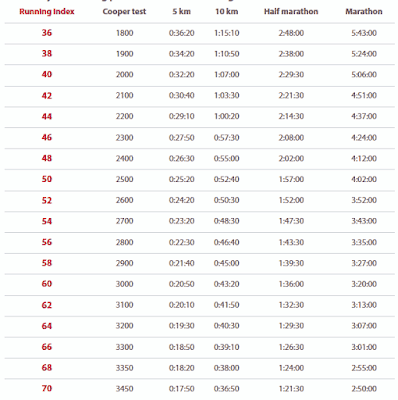 Again, due to random variations in the Stryd data, none of the subjects show a constancy in energy cost of running. Fig. 5 : ECOR (calculated) in 6 subjects. Source of data : Secret of Running (Dijk, Megen). The authors in Secret of Running have argued that the differences in ECOR among runners is of a fundamental nature due to some being more experienced and more "efficient" than others. They suggest in their literature and books that it is important to reduce ECOR and that the Stryd powermeter is sensitive enough to measure ECOR. However, I challenge this idea. I suggest that these authors re-examine if changes in ECOR are really due to training status and running experience or simply due to random variations in the data as Fig. 5 and Dr. Snyder's assertion shows! Otherwise, different interpretations from different people appear to conflict. Statement(s) 3 : [...] there is still a very strong linear relationship between the rate of oxygen consumption values and the Stryd power values. This strong dependence is obviously significantly reduced when these values are normalized by speed, giving a value only slightly larger than that found in the paper. In keeping with Dr. Snyder's advice of analying Stryd data strictly on a subject-by-subject basis, I plot W/kg and metabolic rate of individual subjects separately on one plot and examine the strength of trendline linearity (Fig 6). Each subject's trendline and co-efficient of determination is shown. The plot shows that changes in metabolic rate explain anywhere from 96% to 98% of the variation in W/kg. The relationship is strong but far from 100%. It also shows a similar picture to the data I have collected from my own laboratory VO2max testing. Fig. 5 : Energy cost lof running (calculated) vs cxygen cost of running (calculated). Source of data : Secret of Running (Dijk, Megen). What Aubrey et.al did in their paper (Figure 1) was pool all runner's data together by normalizing the metabolic rate and power/weight ratio by running speed. If we do the same for dataset from Secret of Running, all relationships are blunted and the plot essentially becomes a scatter of points (Fig.6). Fig 6 : Normalized specific power vs normalized VO2. Source of data : Secret of Running (Dijk, Megen). So the methodological error explained by Dr. Snyder seems to be correct. Aubrey et.al must explain why they took this approach and on which former pieces of literature they borrowed this kind of analysis. Stryd power and VO2 show a significant linear relationship. This relationship is pegged in two ways. 1) The Stryd powermeter, by way of algorithm, reports increased watts with increased running speed on flat surfaces. 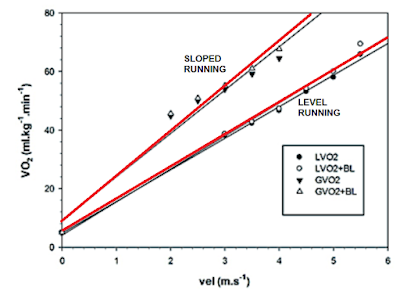 2) By VO2 being positively proportional to speed on flat land running. Statement 4 : Data collection methods are not consistent across surfaces, making effective comparison across surfaces impossible. That Aubrey et.al didn't fully explain data collection methods is a genuine accusation. However, on the same token, articles published by Secret of Running that were used in the chain emailing marketing efforts by Stryd also lacked tremendous clarity on how the authors conducted the tests. For example, the authors Dijk & Megen stated that the energy cost of running increases uphill. The exact magnitude of the increase is in question. Is the nature of the specific increase just due to how the numerator in the algorithm (W/kg) is scaled to increase faster than the denominator (speed) and on what basis were the scaling factors decided? The correlational aspects of Stryd power and above ground gradient running is left to be explored and explained in scientific literature. The methodological "fatal flaw" explained by Dr. Snyder in the Aubrey paper seems to be correct. Aubrey et.al must explain why they took this approach and on which former pieces of literature they borrowed this kind of analysis from. A proper explanation for this choice is desired. On cross-examining statements made with other data from Secret of Running group, Stryd power to weight ratio has a significant positively proportional relationship with speed. However, the data is not exactly linear, more wavy due to the presence of random variations and subject related issues and the slope of a linear trend line varies with subject. Both the energy cost of running and the oxygen cost of running calculated by normalizing power/weight ratio and metabolic rate by speed respectively are not exactly constant when seen in practice. Constancy is shown in literature but real data appears wavy, sometimes monotonically decreasing in certain runners. This maybe due to random errors in the sensor and variations in sensor placement as well as experimental issues in the VO2 data but these facts needs to be appreciated. Therefore, the Stryd as a powermeter must be used to make assertions about metabolic fitness only within subjects, as oppoed to across subjects. If we assume for a moment that Aubrey et.al indeed did due diligence and considered steady state VO2 values across both treadmill and above ground running, the Stryd research team has left some explaining to do why the observed differences in oxygen cost did not reflect in a corresponding difference in Stryd power. At the heart of this explanation lies several extrapolations various people are making on the internet about energy cost of running, running efficiency and oxygen economy, all on the basis of algorithms and no direct measurements of force or power. At the core of a runner's body is a variable pump that manages to spectacularly manipulate it's blood flow output. At rest, the heart pumps roughly 250 ml/min of blood (the idling state), but this can increase two orders of magnitude to upto 22,000 ml/min during maximal exercise (redline). In highly trained athletes, maximal flow volume is of the order of 40,000 ml/min. If you look at the ratio, 40,000/250 is nearly160x times the value at rest. The amount of oxygen that can be removed from circulating blood and used by the working tissues in a given time period is called "VO2". An individual's maximum utilization capacity is represented by maximum oxygen consumption or what is commonly known as "VO2max" in exercise literature. 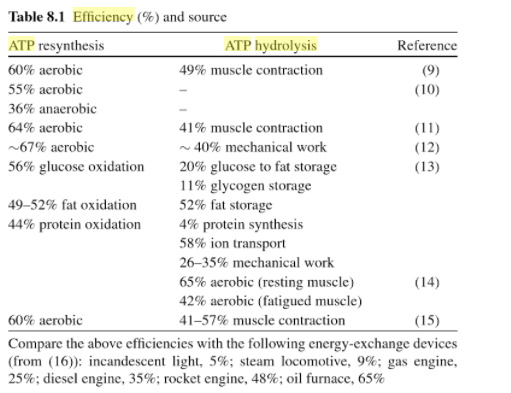 When exercise intensities exceed this aerobic capacity, sources of energy outside of the aerobic system (glycolotic, alactic etc) have to be utilized to support the movement task. Mathematically, VO2 is the product of cardiac output and the amount of oxygen extracted from the blood. The difference between the amount of oxygen within the arterial blood and that within the venous blood returning to the heart is termed the arteriovenous O2 difference (a-VO2diff). This constitutes the extraction capacity of blood. Research indicates that despite increasing age, maximum HR is more or less stable. Therefore, little benefit can be obtained by heart rate increase and any endurance training benefits is derived from the second and third terms in EQUATION 1. In other words, the more stroke volume your heart has and the more oxygen extraction is possible between arterial and venous blood return, the more is VO2max which can then be used to extract more speed out of your running. HR has proven beneficial for normal day-to-day athletes because it shows a satisfactory correlation with physiological variables such as oxygen consumption rate (VO2) and blood lactate accumulation Due to it's correlation with VO2, HR been used to estimate VO2max as well. 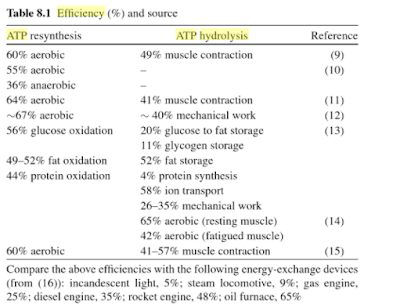 It is also somewhat correlated to metabolic substrate use during exercise (the "Am I using more of Fats or More of Carbohydrate" question) and has been used to estimate energy expenditure in field conditions. 1) The prediction of VO2max from HR is said to rely upon several assumptions and it has been shown that the results can deviate up to 20% from the true value. 2) There appears to be general consensus that this method provides a satisfactory estimate of energy expenditure on a group level, but is not very accurate for individual estimations. 3) HR by itself only answers the "how many beats per minute" question but not the "how much stroke volume per beat" question. 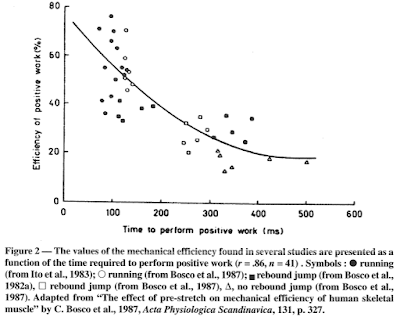 Therefore, specific questions about adaptation to training may not be directly answered by just HR alone. 4) HR is affected by variables - such as weather conditions, hydration status and day-to-day variations such as fatigue. For example, scientific literature states an approximate variation of 3 beats/min in HRmax from day to day. 5) There appears to be a steady increase in HR during activity, a phenomenon termed "cardiac drift". A) To monitor exercise intensity by quantifying time spent in demarcated HR zones. The demarcation of zones is subject to various schools of thought, some being more representative or less representative of athlete physical condition. Generally in practice, HR zones coincide with the accumulation of lactic acid in the blood, with HR associated with low lactate values assigned to low intensity and higher lactate values assigned to high intensity. B) It is valid in correlating internal load, such as Training Impulse (a metric generated with the knowledge of HR) to training outcomes such as fitness, fatigue or performance. For example, a study done in cyclists found that a weekly accumulation of individualized TRIMP of 650 units was necessary to maintain improvements in aerobic fitness (power output at 2 mmol/ L). C) It is used to inform the daily state of an athlete through measurement of a resting pulse. For example, an over-reached state of fatigue may be accompanied by a higher-than-normal resting HR or sleeping HR. 1) A sudden increase (or decrease) in work-rate, i.e running or cycling power, may not coincide with an immediate rise in HR. Due to the "laggy" non-linear response of HR, it is not ideal to use to inform about work rate changes. 2) At the same work rate, HR is known to slowly drift to higher values despite working at the same external load. Scientific studies show that this is partly co-related to dehydration. 3) In hot environments, cardiac drift has been shown to correlate with core body temperature increase. It has also been shown that in hot environments, VO2max can also be lowered. Therefore, a prediction of VO2max using HR becomes baseless. 4) In high altitudes, HR increases inspite of little to no change in VO2 or external load. Therefore, the HR-VO2 curve "right-shifts" and makes sea-level HR zone methodologies suspect. Recovery characteristics of heart rates due to acclimitization are very individual. Input output characteristics are well studied with step inputs. A high intensity interval training session (HIIT) does exactly this - it involves step increases in pace or external power and holding said pace for a prescribed interval. This offers a good chance to study heart rate behavior. Attached below is data from a subject (me) obtained from a HIIT training session where power, heart rate monitor and GPS as a secondary mode of monitoring pace (primary mode = time per lap) were all used in conjuction with each other. Fig 1 : Stacked data showing running power, heart rate and running speed with time from an interval session. The most prominent observation is that in response to step increaes in power requirement (W/kg) or pace, heart rate takes several seconds to increase. This is called cardiac lag. This lag is simply a manifestation of an organic pump in our body that can only increase its beating frequency in a finite time as opposed to an instantaneous response. One of the aims of this workout was to stay within 90-95% VO2. Since heart rate is a surrogate of VO2 and assuming external variables have been controlled for, I might conclude that the aim has been fulfilled in the first 3 of the 4 intervals. At the 4th interval, HRmax has been essentially reached. This value of HRmax completely agrees with value of HRmax reached during laboratory VO2max tests done earlier in the year. Therefore, I might conclude that at virtually no point did I cross my maximum aerobic ceiling until perhaps the very last interval. And it was at this point that I called off the 5 minute session. Therefore, if the aim of the workout was to increase time spent at VO2max, this session wouldn't exactly provide the requirement. However, if the aim was to maximize time spent at between 90-95% of VO2max within the limited time allottment, then I conclude it met the aim mostly. Another use of HR during such an interval session is to monitor the recovery dynamics. With the same amount of rest in between each interval, one finds that the baseline HR reached at the end of each recovery gets progressively higher. Conversely, this means that in each subsequent interval, it would take lesser time for HR to climb to the maximal values necessitated by the workout. In the following diagram (click to zoom), the black lines indicate the slope of HR rise, the blue line would indicate the slope of HR fall and the thick red lines are the baseline HR reached at each recovery. Looking at the data, the slope of HR rise during the first and last 5 minute interval were +0.06 beats/second and +0.04 beats/second respectively. This indicates that the slope tends to the flatten out at the higher HRs. Secondly, the recovery slope is more or less the same, roughly -0.3 beats/second in the first recovery span and -0.28 beats/second after the final interval. However the body's need to supply oxygen keeps HR elevated so within a given recovery time, the baseline recovery HR continues to climb. This, together with the effort signals sensed by the nervous system might indicate to the runner that they would need to stop at some point. Maximum heart rate can be readily determined by running uphill on a slope of 3-4% gradient at your 1500m pace for 3-4 minutes. I find that slopes tend to accelerate the rise of HR compared to the same running paces on flat, simply because of the need for more muscle involvement. The formula can under-estimate actual heart rate by upto 10-20 bpm so caution is advised. 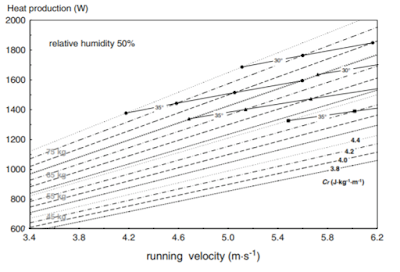 Surrogate metric for operational efficiency : The comparison of HR along with corresponding running pace or power can be used to understand if the running is efficient with respect to the same course and temperature conditions. In an earlier post, I looked at the ratio of running power to heart rate as a potential application of this technique. So I won't expand on this here, but suffice to say it is an interesting area for personal exploration. Dehydration : With dehydration, blood volume decreases leading to less blood pumped with each heart-beat. Earlier, a study published in the Journal of Applied Physiology found that heart rate increased 7 beats per minute for each 1% loss in bodyweight from dehydration. In other words, for a 68 kg runner, a loss of 1-2% of bodyweight which would increase heart rate by about 7-14 beats per minute. This cardiac drift phenomenon increases heart rate with distance and duration. A runner has two ways to compensate for dehydration related heart rate increase. A) The most obvious way to counteract HR drift is to stay hydrated before and during the exercise. B) Account partially for drift and allow heart rate to increase to about +7 beats more than the prescribed maximum by the end of the run. But that might lead to more stress on the body so this is an 'aggressive HR strategy'. C) Account for this 7 beat increase by starting , let's say a 1 hour tempo run, at 7-10 beats lower than prescribed. 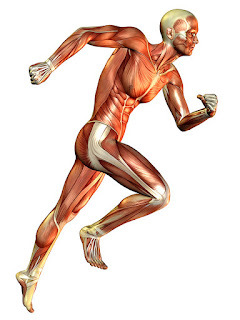 But this might means that the runner will not get the pace simulation for muscle loading and adaptation. This is a 'conservative HR strategy'. Checking recovery : A potentially good benefit of monitoring heart rate is to help avoid overtraining. If a morning heart rate reading is higher than baseline readings during recovery days, it might be an indication of predominance in nervous system sympathetic activity. In simple words, this means the body is either trying hard to cope with hard training or it is stressed out and needs a break. Monitoring waking HR rates is a simple way to check for onset of fatigue or even illness. How valid is it? Only you can collect your own data and decide for yourself. A snapshot of 41 days of supine resting HR from my own data collection indicates that there are days when HR is up and days when HR is down. Over 41 days, the long term trend is one showing a decrease in resting HR which might mean the heart is either adapting and pumping more blood per beat or that my training sessions are not as stressful as they were earlier. Fig 3 : Supine resting HR for 41 days from the author using an ECG holter. 1. I would ask if the maximum HR been plugged into the watch correctly. Typically, a smart watch these days can automatically input maximum HR from stressful workouts into the settings. But normally, this is left to the user to input. Therefore, my question still stands. Has the user entered the correct "field-based" maximum HR into the watch's settings? 2. Has the HR chest strap been wetted ? Moisture and salt helps the electrode 'conduct'. I also do not believe in the reliability of wrist based HR monitors and have exclusively used chest strap systems from Polar for many years. 2. Going by the idea that HR is a surrogate for VO2, a slowly climbing HR is a good sign the workout is delivering oxygen to working muscles in the way it's supposed to. However, it's apt to understand this 'rise' with perceived effort. Is it normal rise or a dehydration or heat related rise? When the running speed is too high, the runner's body dissipates heat at a faster rate than if the speed were slower. At the same time, if ambient humidity is also high then sweat evaporation is reduced, and the only other significant way of body cooling is through heat convection from dilated skin surface blood vessels. For this to happen, the blood has to be shunted away from working muscles to the skin. Without adequate muscular blood supply, the runner may go anaerobic and must soon reduce or stop due to inability to manage heat and/or supply the muscles with oxygen. 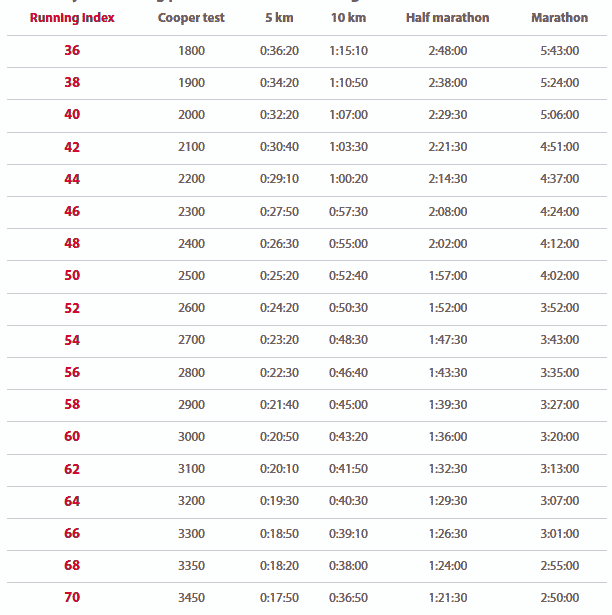 There is a mismatch between the aim of the workout and the selected running speed. The runner must now correct themselves by re-calibrating their speed. Outside of correcting for these factors, if a high HR is still observed, it is prudent to check with a medical practicioner and get an ECG based reading for cardiac health. Just remember, everyone is different. Your neighbour may have a maximum heart rate of 170 but you might be crossing 200. That speaks nothing of either of your athletic capabilities. It is as statistical as one person having bigger feet than another.